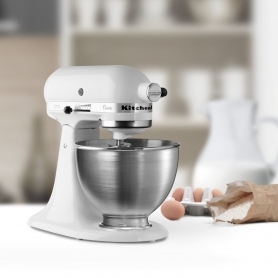 Whether you’re preparing light, fluffy batters and sponges, or denser doughs for bread or puddings, this stand mixer from KitchenAid is the tool you need. The 5K45SSBWH features a white baked-on enamel finish, which is easy to wipe down and will suit any kitchen. This model’s smooth, rounded design looks great, and makes cleaning even easier, with fewer difficult grooves and contours to clean out. 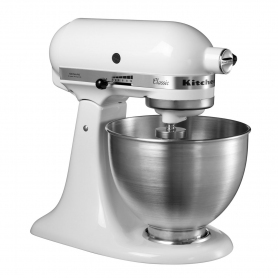 A lift head lever features on this KitchenAid stand mixer – when you’ve combined your ingredients, simply tilt back the head of the mixer and take away the bowl. 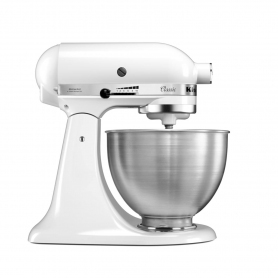 The 5K45SSBWH makes mixing, mashing, slicing and more, quicker and easier than ever. A direct drive motor features on the 5K45SSBWH, providing fast, powerful mixing. 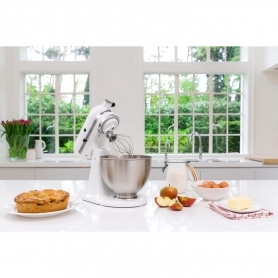 Not only this, but the direct drive motor allows this KitchenAid appliance to run quietly, with better reliability and a longer lifespan than traditional stand mixers. But why stop there? Other attachments available for this model include a vegetable strainer, ice cream maker, ravioli maker and more (please note that these must be purchased separately). 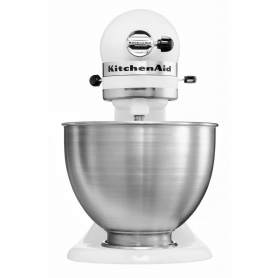 With a sturdy full metal body and range of interchangeable attachments, the 5K45SSBWH from KitchenAid gives you plenty of new options in the kitchen. Order yours today. Smooth Rounded Design, Elegant: easy cleaning and usage. Full Metal Construction: Robust, stable, and durable. Single Multipurpose attachment hub: A wide choice of optional attachments available versatile and easy to use. Excellent performance - Direct Drive Motor: To prepare small and large quantities/batches of food, No power loss between the motor and the accessories/attachments. Orginal Planetary Action: Fast and throught mixing. 4.3L Stainless Steel Bowl: To prepare any type of food.